Innovation coach Matt Lance was a standout soccer player at Bunnell. He never played high school basketball and this was his first high school coaching job in basketball. UNCASVILLE — As the final seconds ticked off the clock in the CIAC Division V championship game, the players from Innovation began jumping on each other on the sideline before piling into a scrum on the court. Innovation coach Matt Lance just stood on the sidelines with his hands on top of his head, not sure where to turn or how to comprehend what just happened. 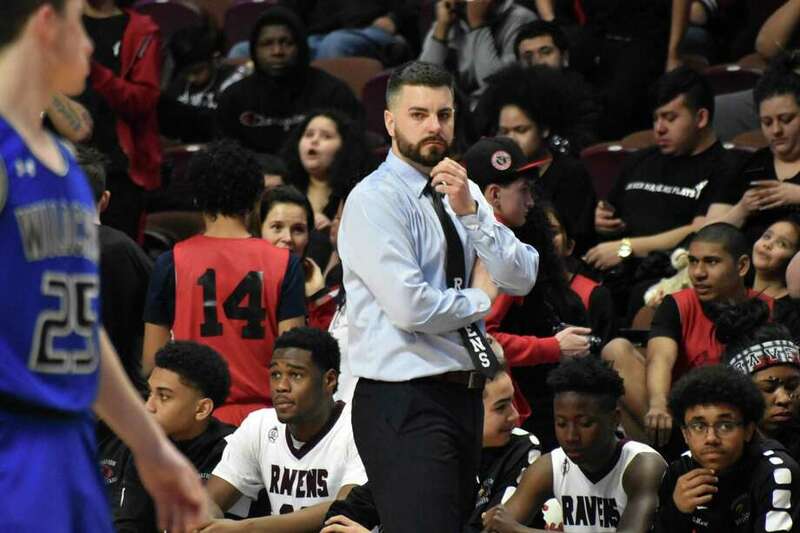 His team, which defeated Old Lyme 62-41 at Mohegan Sun Arena Sunday, was a state champion four years after he and his staff took over an 0-15 team. The Innovation job was the first high school team Lance ever coached after a few seasons coaching middle school teams. What makes the sight of Lance on the sideline celebrating a championship even more improbable was Lance never played high school basketball. The 2007 Bunnell High graduate was a soccer player and New Haven Register All-Area tennis player but that did not mean basketball was off his radar. Growing up in a family of dedicated UConn basketball fans provided Lance with the exposure to the game he would one day coach in to a state title. “I didn’t even play,” he said. “My family are die-hard UConn fans and I would watch the games with my dad and my sister and I would yell at the TV as much as I yell on the sideline. Along with his lessons learned from watching Jim Calhoun coach UConn on TV, Lance was savvy enough to hire assistant coaches with high basketball IQs. Lance, Smith and the other Innovation coaches took over an 0-15 team four seasons ago, going 2-18 the first season and 6-14 the second. The third season, the players on Innovation dedicated themselves to not only qualifying for the state tournament, but winning it. The Ravens lost by two to No. 3 Cromwell in the 2018 Division V quarterfinals and at that point, set their minds on winning it all in 2019. “Four years ago, we took over an 0-15 team and the first year we went 2-18 and then 6-14. I have been with some of these kids since eighth grade. I told them one thing I wanted was to coach them in their last game, right here. For them to go out like this, it’s all about them. Words can’t describe how proud I am,” Lance said. Not bad for the kid from Stratford in his first coaching job.